Slowly dissolve the sugar in the vinegar in a large pan. Add the bay leaves. Prepare the apples, garlic and ginger and add these also with the salt. Bring to the boil, then turn down to a simmer for 2-3 hours until the excess liquid is gone. Cool and jar. Gorgeous in a cheezly and pickle sarny! 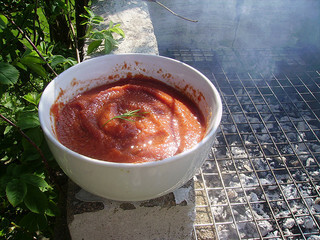 Homemade Ketchup – invented on a day when we lit the barbeque and realised we had no ketchup! 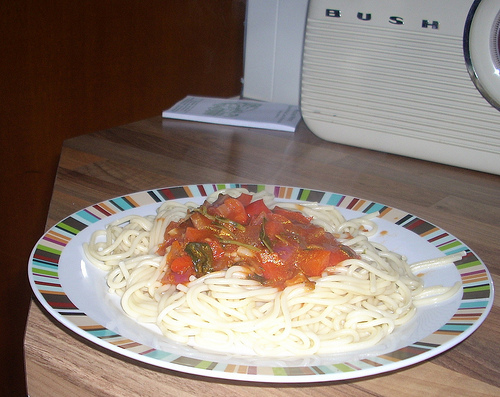 Turned out far nicer than shop bought – very real flavours. or special fitting for a toaster it will be quicker – this is the grill version! Basic cheese and tomato toastie: Toast your bread on both sides then spread marg. 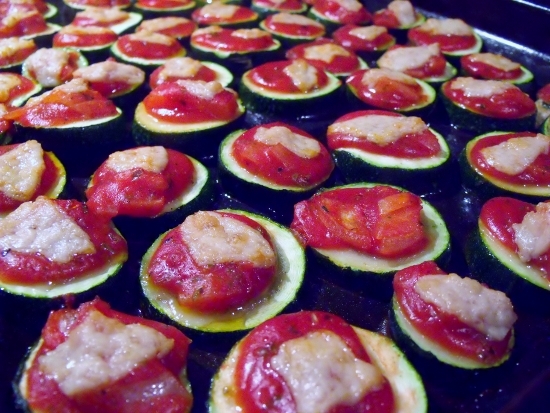 on the insides, cover with thinly sliced cheezly and place under the grill until softened (half a minute or so under a hot grill) – add sliced tomatoes and repeat the grilling until nice and hot – quickly sandwich together and cut into halves or quarters. the snickers – peanut butter and chocolate chips! Place the oil, garlic and basil in a blender and blend until basil is all chopped up but not smooth – add the nuts and blend until desired consistency. We like it not too smooth, still with some nutty texture. Gorgeous mixed into spelt pasta or as a spread in toasted sandwiches. Fry the onion and garlic in the oil for a few minutes until softened. Add the tomatoes, puree, stock or water and herbs and simmer gently for about 15 minutes. That is the basic sauce – you can add anything you like to it. Any vegetables chopped and added with the tomatoes etc. Soya mince for a more traditional bolognese type sauce. Beans, sweetcorn, peas. A sweet and sour sauce is easy to make also – add a can of pineapple pieces in pineapple juice and leave out the herbs. A little vinegar is added too. This is great with beans and vegan sausages chopped up. Slowly warm the soya milk in a pan. Add the chocolate and keep mixing until melted together. Remove from heat. In a cup or small bowl blend the cornflour with a little soya milk and the sugar. Slowly pour this into the chocolate mixture, stirring all the time until thick.